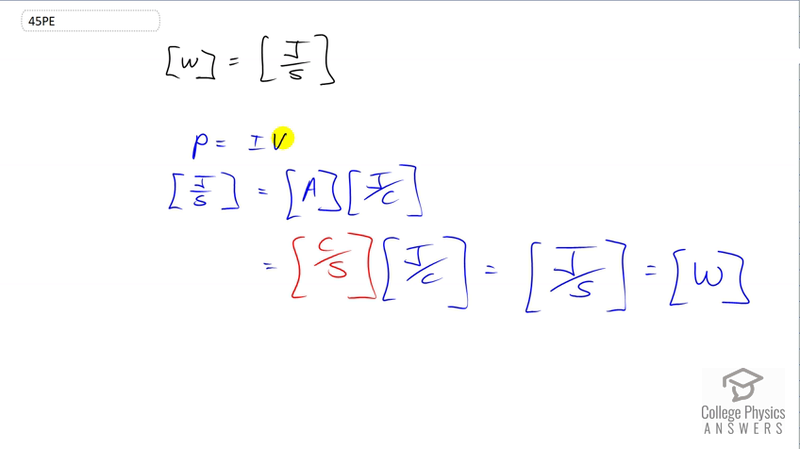 Verify that the units of a volt-ampere are watts, as implied by the equation $P = IV$. see video solution for derivation. This is College Physics Answers with Shaun Dychko. We’re going to verify that the units of a Volt-Ampere are equal to Watts. So the more base units of a Watt is a Joule per second and we can write that in place of the P here and the units of a Volt-Ampere are Ampere multiply by Joules per Coulomb, that’s what a Volt is, and Ampere we can substitute with Coulombs per second, and the Coulombs cancel, leaving us with Joules per second on the right hand side, which we’ve already shown is the units of Watts.